I suppose for any homesteader or farmer, illness in our flocks and herds causes us the most self-doubt relating to our knowledge and skills. 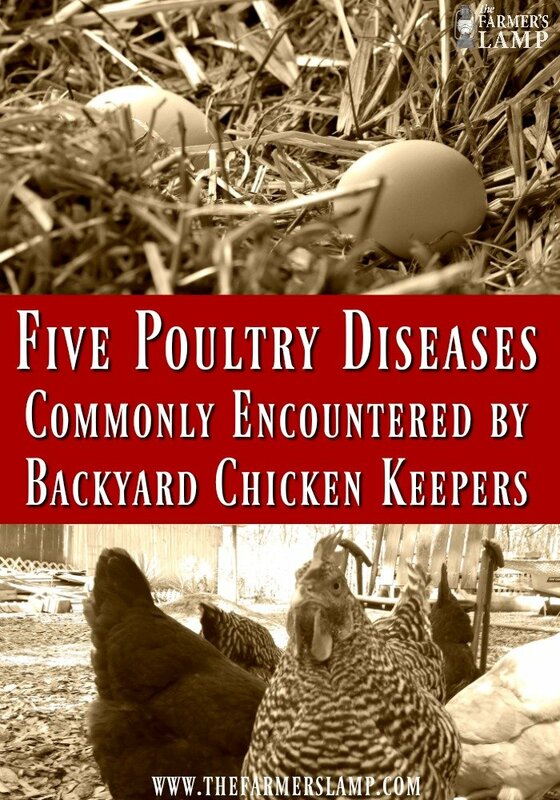 There are five poultry diseases commonly encountered by backyard chicken keepers which I’d like to share with you. Sadly, many vets don’t treat diseases in poultry. Poultry is viewed as easily replaceable. Our former vet was a doctor of natural veterinarian medicine before she retired, and they are even rarer. She would offer advice, but she did not include treatment of poultry or fowl as a part of her practice. Because of our integrated methods and natural health practices, we don’t often use veterinarian services. As sustenance farmers, we do all we can to ensure the health and well-being of our animals through diet and proper land management. When it comes to infectious diseases in our poultry flocks, we usually cull the sick bird immediately to prevent infection of the whole flock. This is a harsh reality of sustainable homesteading and farming. Now don’t get me wrong, we take measures to help the animals when they’re sick. All of our livestock is given the healthiest diet possible. We practice free ranging of all poultry flocks and supplement their diet with an organic, non-GMO feed, herbs, and all the garden produce we can spare. At the first sign of trouble, we give the entire flock apple cider vinegar water. We immediately isolate and carefully watch over any bird in a questionable state of health. Because our livestock, including poultry, are food sources for sustenance farmers, we treat them with respect and dignity. We practice the principles I learned from my maternal grandparents. There are five poultry diseases which are more commonly encountered by backyard chicken keepers. If you’re familiar with the symptoms and treatments of these diseases, you can be prepared in the event you have to face them. In my 35 plus years of keeping chickens, I’ve only had Coryza in my chicken flock and that was once almost 10 years ago. If you’ve kept chickens for any length of time, you’ve probably had to deal with at least one of these. We believe the best way to deal with disease is through prevention. Ensuring your flock is provided with what they need to have healthy immune systems is the primary way to ensure little to no disease enters your coops. This can be achieved by making a few simple additions to their diet. To start with, you can feed your flock garlic and ACV. Mix one clove of finely minced garlic and 1 tablespoon raw, organic apple cider vinegar in one gallon of water. Offer this for two-three days at least twice a month. When the seasons are changing, offer it for a full week. If your flocks experience stress of any kind, like a predator attack, offer it for two-three days. At the first sign of illness offer it for a full week. We also recommend mixing a quality granulated or powdered garlic in their feed a few times a month. I just sprinkle the top of the feed in the food bucket to ensure there is a good layer and mix it. For those who want an exact measurement, the recommended ratio is 2% garlic to however much feed you use. We say “poultry diseases which are more commonly encountered by backyard chicken keepers” because those who run commercial chicken houses are a totally different world which cannot be compared. My paternal grandfather had chicken houses until his death when I was 16 years old, so I know first-hand how different the flock keeping is from us. At any rate, let’s look at the five poultry diseases which are more commonly encountered by backyard chicken keepers, how to recognize them, and options for treatment. 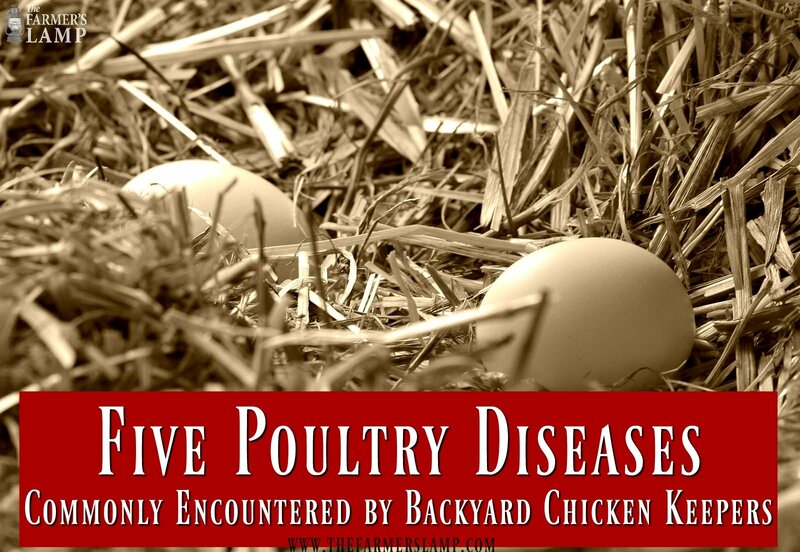 This is probably the most common poultry disease in backyard flocks. Cases range in severity from mild to severe. Most all flocks are exposed to it from wildlife and develop a certain resistance to it. You’ll notice a decrease in egg laying – often the egg itself may be misshapen, soft-shelled, and watery inside. If the kidneys of a bird are affected, you’ll see increased drinking, sluggishness, and scours. While there is a vaccination against this disease, it doesn’t prevent the infection. Studies show it may increase the recovery time. We ourselves do not use vaccinations. There is an antibiotic treatment available however you must consider the cost, the difficulty in giving the medication and the fact that the outcome may still be the loss of life. You may want to use a heat lamp on the sick birds to keep them warm. Infectious Sinusitis is also known as Mycoplasmosis (Mycoplasma Gallisepticu). This disease affects all types of poultry. The symptoms appear the same in each kind, i.e., turkeys, chickens, ducks, guineas…. Antibiotics have been used successfully to treat infectious sinusitis. However, preventative health maintenance can keep most all diseases out of your flocks. There are a few fatalities from this disease. Except for infectious sinusitis, fowlpox has fewer fatalities than most other poultry diseases. Often, especially with a novice chicken keeper, fowlpox will pass through a flock unnoticed. White blister-like lesions which more noticeably appear on the combs and wattles of the infected birds. If the case is extreme, you’ll find lesions on the legs and body. The lesions develop scabs which will heal and fall off in about three weeks often leaving a scar, much like chicken pox in a human. Breathing difficulty can occur if lesions develop in the mouth and throat. This rare development is usually the only cause of death from fowl pox. Many poultry breeders prefer to vaccinate on the off chance of decreasing the risk of fowl pox. Some researchers say areas with a high mosquito population are higher risk. A healthy immune system can help protect your flock. In 2015, record numbers of birds were killed by this disease. Although most of the deaths were among commercial poultry farms, more backyard chicken flocks were affected than ever before. This disease is especially deadly because it can be carried across species. It was brought into our area by wild birds, or so we were told by the authorities. Our flock was unaffected, thankfully. The authorities also say it can be transported from farm to farm on our shoes, and by way of insects and rodents if they come in contact with the mucous and feces of an infected bird. Similarly with birds, as in humans, antibiotics have proven ineffective against viruses. As with all disease, proper nutrition and health maintenance is the best prevention. As a matter of fact, during the outbreak of 2015, the USDA and other government agencies forced the mass culling of many flocks to “prevent the spreading.” Some backyard chicken keepers reported their flocks were seized and killed without showing any signs or symptoms of avian influenza. For more information about avian influenza and what you can do to prevent it, read our article here. You’ve probably heard it called cold or croup. Coryza devastated our chicken flock almost 10 years ago. This is the first and only disease we’ve had to deal with in over 35 years of chicken keeping. I had no experience to act on which made it worse for them. This happened before we started focusing on natural health maintenance and preventative treatment of our livestock. When we became educated on the health dangers of GMOs, pesticides, herbicides, and chemical fertilizers, the whole way of life on our homestead changed. Sadly, this devastating experience was part of the springboard for prevention versus reaction. Consequently, having a sick animal can make you feel helpless. They can’t tell us where it hurts or how they feel! I believe it’s important for you to always use your own judgment when taking advice from anyone, including myself, especially online advice. Not that myself or anyone else would mislead you purposely, but without personal knowledge of your flock and not being able to see and handle your birds, no one can say exactly what is going on in your flock. I’m sure you noticed many of these diseases share common symptoms. If you’re blessed to know a local, experienced chicken keeper or a vet who deals with poultry, build a relationship with them and ask for help when deciding what to do. Most of us are happy to share and help one another. In all honesty, it is necessary for me to say the information I’ve shared with you is just that, information. I am not attempting to diagnose or treat your poultry. The health and well-being of your homestead and all who live there is solely your responsibility. Like us, animals benefit from a healthy immune system. I can only share with you what we do for ourselves and the livestock entrusted to our care. Lastly, a word of caution. NEVER eat a sick animal. Unfortunately, the risk of disease being transmitted to people through their feces, respirations, and ingestion of diseased flesh is high. Furthermore, if we have an animal die, especially poultry, we burn it. This is the best thing to do to prevent any possible risk of poultry disease spreading in our flocks or to people. Have you had to cope with any of these poultry diseases which are more commonly encountered by backyard chicken keepers? Have you had one in your flock I didn’t mention? Please share your experience with us. In addition to the above information, we have more articles about raising happy, healthy chickens you will enjoy.